Celebrating another year of life in this world is truly a blessing most especially if you get a hold of the chance to celebrate it with your loved ones. 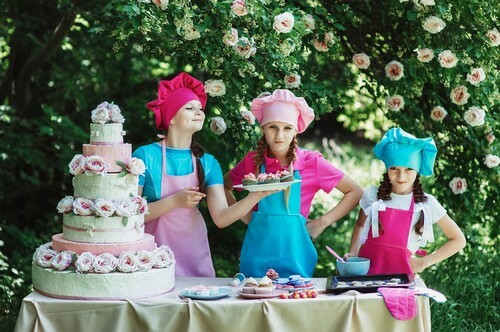 No matter how many years piled up, each birthday should be celebrated happily and cheerfully with or without a party, gifts, balloons and birthday cake. 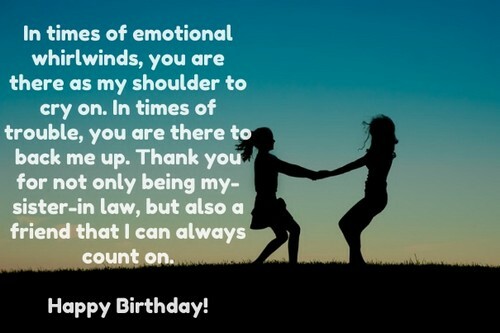 Sincere and heartfelt birthday greetings and wishes can make anybody’s birthday extra special, with this in mind, we compiled the best birthday quotes which everybody can make use of to express their greetings or send their birthday wishes to someone whose celebrating a birthday. As you add another year to your wonderful life, keep in mind that it is the journey that counts not the destination. The simplest things in life count the most, like a simple wish. Happy Birthday! It is not the age that will tell when and how one’s life sparking begins, it is one’s choice. Count the heartfelt wishes and pleasant cheers but don’t count the years. Life is a great and long journey. Make sure to enjoy every mile. Stop for looking for a heaven in the sky. Make your own heaven right here instead while you have your years. The number of birthday candles does not matter but it is the light that they give. The number in your age doesn’t mater but it is the kind of life that you live. I hope and pray that our birthday is wonderful, because it is a good reason to celebrate. All I wanted to say is Happy Birthday, and I wish you have the best party ever. I support wildlife, you support wildlife: have a wild birthday party. Some people look old and feel young. Some people look young and feel old. Some people like us look young and feel young. So let’s party on your birthday like there is no tomorrow. Celebrate the best ever birthday party today but do not forget to celebrate each day and everyday as well for each day brings its own happiness to your life. Just wanted to say Happy Birthday and may you have the best day ever. All I hope that today on your birthday, at your party, you will dance while others sing as you celebrate with joy. There is still no cure for your crazy birthday despite the advancement in medicine technology. I wanted to write the best birthday greeting ever but I lost my pen so I just bought this card. Happy Birthday! Sending my greetings to the very charming, talented and witty person, and reminds me a lot of myself. Most people say that the best and most effective way to remember someone’s birthdays is to forget it once, but I guess Facebook reminder is the best. Your new age loves you very much because it looks good on you. I hope your birthday is as fun as you are. I wish that your birthday includes a cool day and a hot night. Happy Birthday! I wish that you will have a magical day full of love and joy! Happy birthday to you my sweetheart! Happy Birthday sweetheart! I love you to the moon and back! Enjoy your day! Today, which is your birthday, I just want to say I hope you can see how much you mean to me. I love you darling! Happy Birthday! Happy Birthday to the person who becomes my world. I hope your wishes will come true because mine did when I met you! Thank you for always being at my side sweetheart. The magic is everywhere; cheerfulness is in the air as your birthday is here. 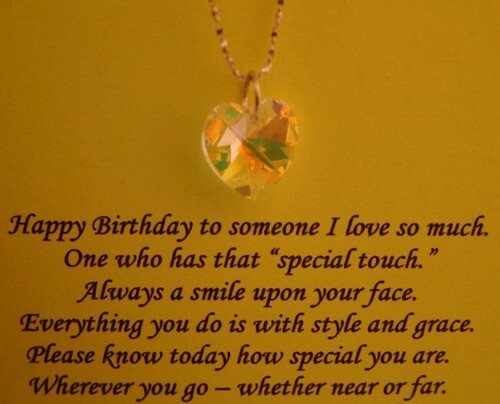 I wish you will have a special day as special as you are. Happy Birthday my love. Sending you a box full of sweeties, wrapped up in loads of my love. Have a yummy chummy birthday. I wish you will be treated as a princess on your special day. Happy Birthday princess! A birthday is just any other day where you g on your day and people around you gives you love. Age is just a state of mind; you are as old as you think you are. Happy Birthday chaps! Adding another year to your life is blessing enough. Happy Birthday! Count the blessings and be happy. Birthdays are good for you because the more you have, the longer you live. Birthday is an important occasion and it should be remembered because not everybody gets to have another year to celebrate with. Anyone who keeps the ability to see beauty will never grow old no matter how many years will be added to one’s life. The secret of staying young is to live honestly, eat gradually and don’t mention anything about your real age. Birthday is the best excuse to eat cakes when you are in a strict diet. Birthdays do not only add another year to a life, it also gives a new chance to start anew. God gave us the gift of life; it is up to us to grant ourselves the gift of living happy and well. Happy Birthday to you and may your special day be surrounded with cheerfulness, filled with laughter, wrapped with delight, brighten with excitement, filled with love, remembered with bliss and enriched with hopes. Happy birthday to my much loved person, may your birthday bring each extraordinary thing that you have waited for and everyday ahead holds lots of glee in the store. Many happy returns of the day don’t forget to smile while you still have teeth. On your birthday I would like to give you some words of wisdom, let it be. Today is your birthday. You are older than yesterday and younger than tomorrow. Happiest birthday to you my friend. Happy Birthday! May God you have a wonderful day and a fabulous year. Happy Birthday to my special someone who will be forever young. May your special day be filled with good memories and colorful flowers, true friendship and happy hours. A simple but wonderful celebration, a gathering of real friends; here is wishing you happiness a joy that never ends. On your birthday, I only hope that all of your wishes and dreams in life will come true. I hope that you have the best birthday ever from the moment you open your eyes wide awake in the morning until they close shut at night. 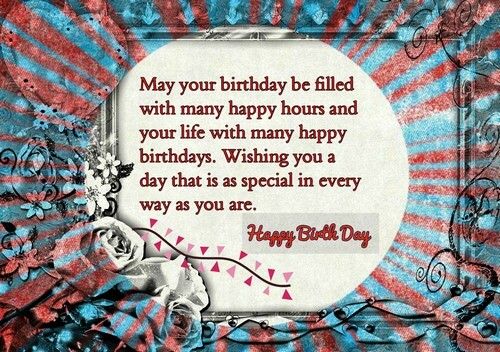 Have a blast with best birthday wishes from your dear one. They said that the first birthday wish is always special. 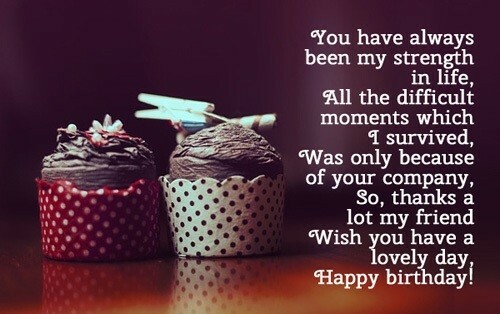 I was the first one to wish you a happy birthday to let you know how special you are to me. Have a day off to celebrate your birthday because you deserve it. You are now a year older but you haven’t change a single bit but that is okay because you are already awesome just the way you are. Happiest Birthday to you! Good things happen to good people and you are definitely one of those, happiest birthday sweetie. Happiest Birthday to my only best friend, I will always be there for you except if we will jump out of a 10-story building without any parachute or a trampoline that will catch us. Then I will miss you! My finest wishes on your special day! I cannot decide what to buy between all those cool gifts, so wrapped myself up because I will be the most perfect gift you will have. Happiest birthday pal! Do not mind the fact that you are aging, instead let us start celebrating. Wishing my girl a very lovely and awesome day; whatever your heart’s desire and content I’m sending your way. May all be fine and all your wishes come true on this very extraordinary day for you! On your special day, I wish you to have the guts to live and fulfill at least one more of your many dreams, fulfill one more desire and make yourself happy. I made a special recipe for your year ahead, should be 20% love mixed with 30% Luck. Add on top 20% courage and garnish it 30% good health. Say cheers to life and have a wonderful and memorable birthday! 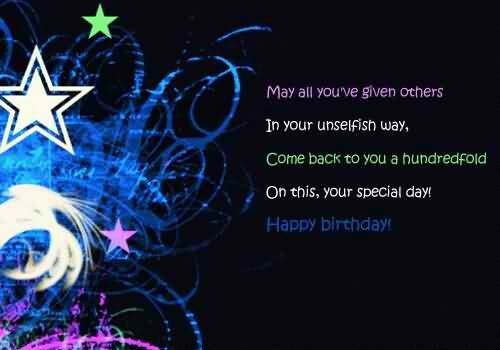 I hope a genie will grant my three wishes for your birthday. First, I wish that this birthday teaches you something new and beautiful. Second, I wish that you will have a day that you will forever remember with a smile. Lastly, I wish that such days keep coming in every single day. Wonder why I never ask any gift from God? That is because He has given me a special friend like you. Happy Birthday dearest friend. As you blow the candles and cut your cake, do not forget that you will always have a friend who will always be there for you no matter what happen especially if you have food with you. I can’t find the right words to give you the best greeting ever, so let me just say Happy Birthday and I hope you will have a wonderful day ahead which will turn to a memorable day tomorrow. Friend, count the age but not the wrinkles on your face. Count the blessings and wonderful experiences but not the mistakes that you have made. Enjoy your most special day! Forget and bury your past, look forward to the promising future because the best things are yet to come. 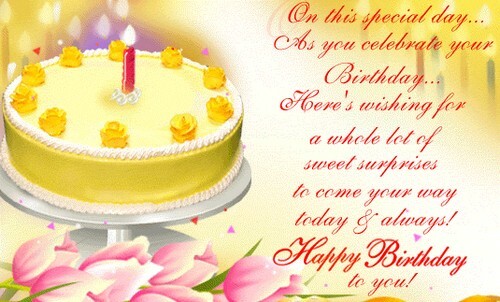 There could not be a better day, to take a chance to say that you are wished a happy birthday! Today is your special day, it’s time to enjoy your favorite things and feel happy all day. I am about to tell you a secret. As far as I know you, today you are the oldest. Happy birthday friend! 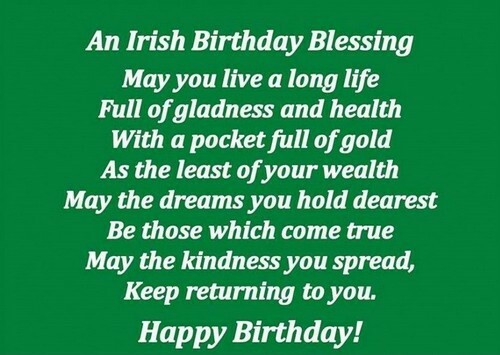 Wishing you a pot of gold and all the blessings your life can hold. May your birthday mark the beginning of a fantastic period in your life. Dream big and may your dreams take you to a fantastic place, where your heart always wanted to be. Happy birthday to you! Pull up the sails and turn your ship towards the adventure of life. Have a superb day and awesome year ahead of you pal! Have an out of this world day filled with everything you love most!